This afternoon I came across a Dubl Duck aluminum "professional use only" brush. Model M-3. made in Germany. Boar of course, and still in the original box, appears to be unused. No evidence of wear, and it will shine like a diamond with a bit of polish. After all these years, it is not surprising that the boar hair is in need of a new knot. As time goes by, I'll consider which knot should be used. As everyone already knows, I'm currently obsessed with the most current generation of synthetics. I haven't taken any pictures of it yet. Maybe later. Considering how nice the handsome SilkSmoke synthetic looks in the leadwood custom turned handle from Vladimir Ferdman looks, my wife suggested that the SilkSmoke might be a strong candidate for this big shiny aluminum handle. Here's a picture after polishing. Last edited by brothers on Wed Mar 21, 2018 12:40 pm, edited 1 time in total. Here's an update. 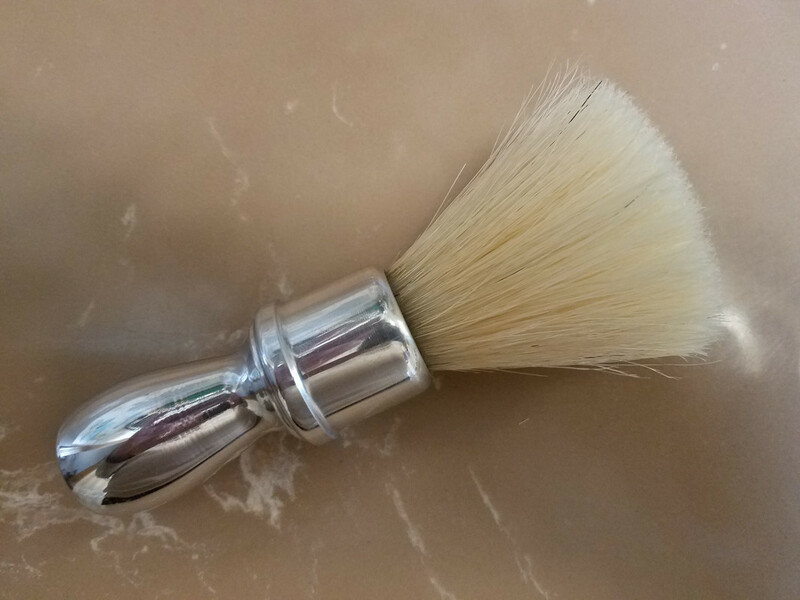 This one is a magnificent flat-top boar brush. I mistakenly thought the brush was going to be a shedder. Evidently not! After two palm lathers and a vigorous workout in loading, lathering and rinsing, there are no more stray hairs than the few that were falling out when I first picked it up. The brush apparently has never seen water or soap/cream. I decided to treat it just as any other new boar brush (in spite of the fact it's spent several decades in the box). What I thought was shedding was apparently just the few stray hairs that are associated with the manufacturing process. Most amazingly, there's no new-boar-brush stink! It's not broken in, and doesn't have any split ends yet. I'm going to keep palm-lathering it for a while. Then I'll eventually use it to face-lather and see how I like it. Here's a photo of the big pretty brush while it's in bloom after two back-to-back palm lathering exercises. Last edited by brothers on Sun Apr 15, 2018 9:29 am, edited 1 time in total. Gary, that thing is gorgeous! It looks like it could have been made yesterday. I can't wait to hear the field report on it's performance. My prediction is that it's like new. What I'll also be interested in is if there is any noticeable difference vis a vis a new boar, I imagine there would be and that the nod would go to the vintage brush. I might be wrong but I'm genuinely interested to know. Neat-looking brush, Gary. Glad to hear the bristle is still good. Murray and Chris, the boar bristles are in great shape. As you suggested, the bristles seem a bit finer than my more current boars. Today I decided to use it with my unexpected new tallow shaving soap made in UK. I've been testing the DD by lathering on my hand and letting it dry completely before the next test. Quite a few of the old bristles are well-split on the ends already. It's still a bit prickly which is not unusual for a boar. It made a very good lather for today's shave with a new shaving soap. It'll never outperform my synthetics and badgers in lathering, but because the soap is quite competent, the boar brush didn't take anything away from the lather and the shave. I'm very happy I found this pretty old brush and that it's probably just as nice as the day it was first made. Gray, great field report! I wish you many years of enjoyment from that brush, sounds like it's a winner. On another note, I can't see the brush image anymore. Did we loose something on this site? Thanks for the report, Gary. I bought a couple of Vulfix boar brushes with resin handles, a few years back, and they had a finer bristle than most today. I see them still on offer at the Shoe Box Shave Shop. Don't know how that happened, but I've fixed it now. Thanks for the heads-up!